Clara Oloriz is a PhD researcher, tutor and practising architect. She studied architecture at the ETSA Universidad de Navarra. She has worked for Foreign Office Architects, Plasma Studio and Groundlab. She teaches at the University of Navarra and has collaborated as visiting tutor on the AALU Masters programme, currently in the Scripting Prototypes workshop, and a number of global workshops such as the visiting school in Mexico City. At present, she is finalising her PhD as visiting student at the Architectural Association. Along with her PhD research she has contributed to several congresses and magazines and she is initiating a research cluster on Urban Prototypes. This thesis reflects on the relationship between technology and architecture. In particular, it explores how mass-production and industrialisation in the decades after World War II not only transformed production and construction, but also reconfigured the practice of architecture. 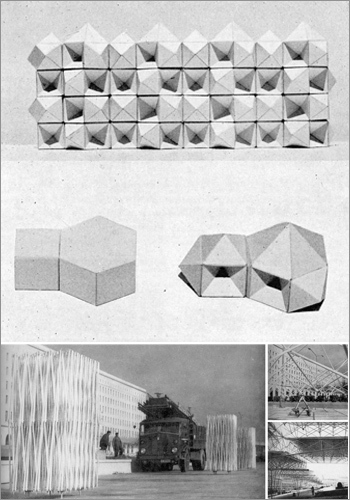 Through the analysis of new methods of construction in Spain during the 1950s and 60s, the investigation examines the concept of component design and the resulting production systems from a material, structural, formal and spatial perspective. PhD completed in 2012.